Do you have a dream internship? Laura did, and ELI helped her make it come true. 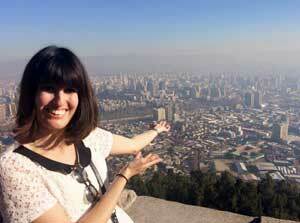 The Spanish major is no stranger to working in South America – she did an ELI teaching program in Argentina in 2013 – but this time Laura wanted something much harder to find: a position with a publisher or a literary journal. As luck would have it, a literary publisher in Chile was willing to take a chance on a non-native speaker who loves Spanish and Spanish-language literature, and last summer Laura headed south – waaay south – to the capital city of Santiago for a 9-week editorial internship. “The first week was a bit overwhelming,” she remembers. “There was definitely a linguistic adjustment,” she says, referring to having to adapt to Chile’s somewhat different Spanish and its rich but unusual – and often slangy -- vocabulary. But she quickly became attuned to Chilean Spanish, something she still treasures. “I can spot a Chilean a mile away!” she laughs. ELI helped Laura find a shared apartment whose landlady became a close friend. In a way, Laura had the best of both worlds: the independence of being in an apartment with the bonus of having the support and friendship of an almost-host mother. “My landlady and I would have breakfast together on Sundays, and she took me around Santiago, too.” Not that Laura had a lot of spare time. Her internship at the publishing house offered tremendous opportunities. Laura copy edited books heading into print; she proofed, checked indexes and verified bibliographies. The material included everything from academic essays to poetry and even a non-fiction book translated from English into Spanish. Her work must have made a very good impression, because soon the publishing staff began inviting Laura to book launching parties where she was introduced to Chile’s diverse scholarly and artistic community. Laura’s Chilean adventure has had a profound impact: she plans to devote part of her senior thesis to Chilean literature, and she now has solid editorial and scholarly experience on her resume. She may even try to get a paying position with the same Santiago publisher where she interned last summer. One thing’s for sure: with Laura’s skills and her background in Latin America, this young woman is going places.